In this adventure, while Slim is on his way into town to do some Christmas shopping, Wallace the Buzzard flies through the windshield of his pickup. Wounded and knocked silly, Wallace goes to town with Slim, Hank, Drover, and Little Alfred to watch a Santa Claus parade. Then, to top it all off, a gang of town dogs shows up! 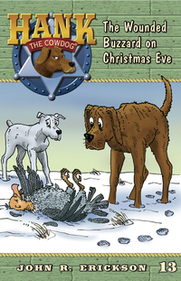 Will Wallace be Christmas dinner for Buster and Muggs? And, what's this about a sniveling poodle versus Hank?